It's Merlin... but not as you know it. The enduring legend of King Arthur has been a rich hunting ground for cinema over the years, with films such as The Sword in the Stone, Camelot and First Knight bringing their own interpretations of the mystical story to life on the big screen. This time round, it's the turn of director Joe Cornish - formerly one half of The Adam and Joe Show and director of horror comedy Attack the Block. He's enlisted the talents of Sir Patrick Stewart, no less, to help bring his modern take on the famous tale to the masses. Set in modern-day London, The Kid Who Would Be King follows a group of kids who try to save the world from the evil Morgana, after Alex (played by Louis Ashbourne Serkis, son of Andy Serkis) finds the sword in the stone on a derelict building site. Sir Patrick - the Shakespearean titan of the British stage in the 60s, 70s and 80s - found global fame as Jean-Luc Picard in Star-Trek: The Next Generation, before going on to play Professor X in the X-Men franchise. He will soon be reprising his Star Trek role for a new series, but his latest performance as Merlin is new territory. 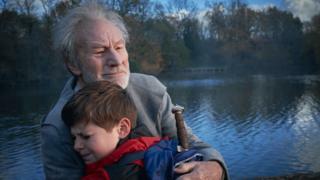 Sir Patrick is sharing the role with rising star Angus Imrie, with both actors inhabiting the chameleon-like wizard at various points throughout the film. The old Merlin - Sir Patrick - pops up when the kids in the film need an authority figure in moments of crisis. Sir Patrick says his performance was inspired by Nicol Williamson's portrayal of Merlin in John Boorman's 1981 film Excalibur, in which Sir Patrick played Sir Leondegrance, Queen Guinevere's father. "In this movie with the old and the young Merlin, there is a playful aspect behind all the fury and rage and despair and urgency," he says. "There is a lightness... in Excalibur, Merlin was played by Nicol Williamson and Nicol was a playful character himself. He brought great irony to his performance and a winsome wistfulness about him, and I just stood back and admired and adored." Thankfully, Sir Patrick's experience was less fraught than Williamson's. "He nearly died on that movie - there was a huge scaling tower up against the castle tower that fell over and hit him on the head, but he was wearing a silver helmet that saved his life." Of course, health and safety weren't what they are now. "Now, heads would roll as Nicol's nearly did!" Sir Patrick jokes. Neither of Cornish's Merlins go in for the traditional wizard look - the robe and hat are replaced by bed hair and a Led Zeppelin T-shirt. "Merlin isn't bothered what he wears, he just wears what's available to him," Imrie explains. "It might remind him of something he's familiar with. Which is why he picks up a coat with a hood as it reminds him of something he might have worn in the past. But he's without the airs and graces, the insecurities about how he looks that people might be hung up about." Merlin is the lynchpin of the movie, an advisor, mentor and father figure. Imrie is a revelation as the charismatic, beguiling and eccentric young wizard and steals pretty much every scene he's in. He comes from good acting stock - his mother is Celia Imrie and his late father, Benjamin Whitrow, was also an actor. But this was his first major film role, with big action pieces, special effects and so on. How did he find it? "It's fantastic being on these phenomenal sets, and working with actors like Sir Patrick was such an exciting prospect. "It just makes you remember, when we did the rooftop stuff, and it was all green screen and massive sets and everything, really it's just about that little moment that happens between you and the other actor. "The lens is always the same size, it doesn't get any more expansive just because of the budget, and I think that's a really good thing to hold on to." So what does his mum think of his career choice? "She came on Sunday (to the premiere) and she's incredibly supportive. She wasn't when I said I wanted to be an actor, she was far more discouraging because she knows how difficult it is. But she realised I was serious about it [and] she's been very encouraging. "But we're mother and son, that's the predominant relationship but we have a very good creative relationship, too." The film carries a strong message about healing divisions which appears to be a thinly-veiled critique on the Brexit situation. Imrie says: "Joe is attuned to something in the air, that there is a division, that we need to call on young people to rise up and they are powerful and they can make a change and a really positive one." Sir Patrick adds: "What links the US - my wife is American - and us [in the UK] is that millions of people have not felt connected, have felt disenfranchised and are really having a tough time of it. So when someone comes along and says we're going to change all that right away - which is not possible to do - it's attractive because people do not feel represented or understood. "Surely there are more important things than building a wall between Mexico and the US, surely there's more important things to do than throwing business out of our country? "A country is only as good as its leaders." The Kid Who Would Be King is released in the UK and Ireland on Friday.